This year has been big for Pixar. Not only was Inside Out a critical and commercial success, but their upcoming second original feature of the year- The Good Dinosaur- is also attracting positive buzz. Next year, however, will see the release of the sequel to one of their most beloved films, with Finding Dory arriving next June. This week the first teaser for next year's film has been released. Interestingly, it feels like a bit of a throwback to Pixar teasers of old, with the trailer being essentially a short extract from the film. 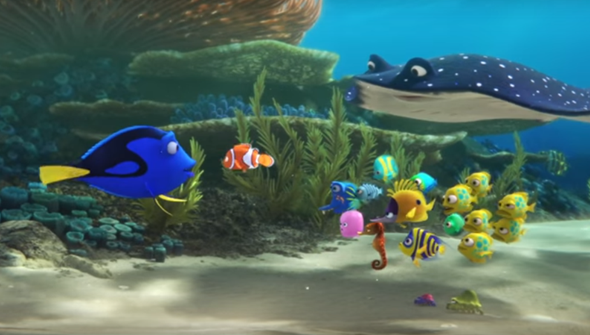 It sets up the sequel's basic premise- that scatter-brained Dory sets off in search of her family- while giving us a chance to revisit the characters we met in the 2003 original. Despite the popularity of the first film- or perhaps because of it- there seems to have been a lack of excitement surrounding Andrew Stanton's fishy sequel thus far. However, we suspect that for many viewers any trepidation will melt away the minute they are reintroduced to the undersea world and its inhabitants. Even for those who remain wary though, it's going to be fascinating to see how more than a decade's worth of advances in animation technology since the original will allow Pixar's animation wizards to showcase the wonders beneath the waves. Finding Dory will be released in North America on June 17th 2016.